You would like to be informed about Jenny Holzer's new arrivals in advance? Register now for free! Jenny Holzer’s artworks and editions developed from abstract painting into purely text based works. Her most famous series is “Truisms” in which she qutoes common kowlegde and sayings. These one scentence phrases come in different forms of presentation: in long lists, as montage with photo and text and within the public space on billboards and such. A photo of a billboard stating “The Abuse of Power comes as no Suprise“ from the 1980s became particularly relevant in the recent debates on sexism. Jenny Holzer is famous for her activism concerning the deconstruction of power structures with regards to violence and sexuality. 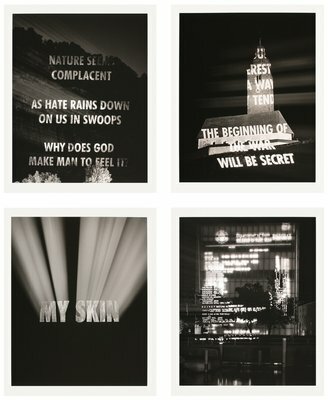 Jenny Holzer’s artworks and editions are exhibited in major museums around the world and are part of many public and private collections. You want to learn more about the artist? Visit Jenny Holzer to get more details about the artist's works. You want to buy artworks and editions of Jenny Holzer, but you have further questions? We collected detailed information for this purpose.